The freezing cold temperatures had given way to a much more bearable 32 degrees this morning and I had hoped to resume running with my 9 year old son today. The snow and bone chilling cold had forced him to take a hiatus for the last three weekends and he had mentioned that he really wanted to run. Unfortunately the poor guy had an accident while cleaning up the dishes yesterday when a plate fell on his big toe. This required a trip to the emergency pediatrician's office last night and no activity of any kind prescribed for the next five days. So much for us running together this weekend. I headed out alone this morning and didn't check the temperature before I left. I quickly regretted all my layers when I realized that it was almost twice as warm as Saturday's 18 degrees. Instead of hating the wind I began wishing for more of it. Today's run was less taxing than Saturday's and I ran about 4 miles. I still felt a bit sluggish and my pace reflected it; 12/sec per mile slower than yesterday. 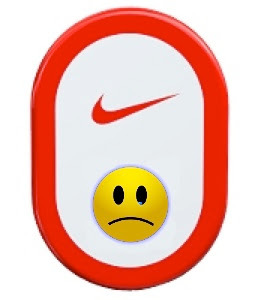 When I tried to sync my Sportband with the Nike+ site I got the same "No runs to upload" message that I got the day before. Fortunately the device still records events accurately so I can manually capture the data and input it into MapMyRun. There is a way to manually create an XML message with the run data that can be uploaded to the Nike+ site. I'm debating whether I want to take the trouble do something that won't reflect the real time performance of my workout. After all, that's whole the point of the Nike+ system. I should be frustrated and angry that the Sportband has failed me in so many ways but I'm taking a glass-half-full perspective. Now I'll get to buy and play with a new technology that will give me even more features than my Sportband. Despite the fact that I've had the Sportband (make that three Sportbands) over the last five months and have recorded hundreds of runs, I will get my entire investment back and this will help fund my new purchase. I only wish I could make my son's toe problem go away so easily. I have to say that the Garmin Forerunner 405 is very fun! I'm still figuring out all of the options, but once I get back up to speed, I'm looking forward to training with the HR monitor! Hope your son can run with you soon - my daughter "runs" with me too sometimes - at age 4, she doesn't go far (she's surprisingly fast, though), but I love that she wants to "be a runner" when she grows up... I can't help but think that having positive experiences with physical activity now will have a lot of impact on them as they grow up! Thanks - I'm really torn between the 405 and the 50. My issue with the 405 is that the all-in cost with the HRM and foot pod is well over $400 while the 50 with all that (but no GPS) is about $150. Running with my son is one of my favorite things to do. My 10 year old daughter sometimes runs with us and I really love when they both participate. I want her to be a "Girl who Runs" too!